And then I remembered. . .
You see, one could say Dad, Scott, Bud, and I had experienced a few good late season hunts down in Klamath Falls, Oregon. Actually, it would not be an overstatement to say a couple of the days afield down there had been downright amazing. 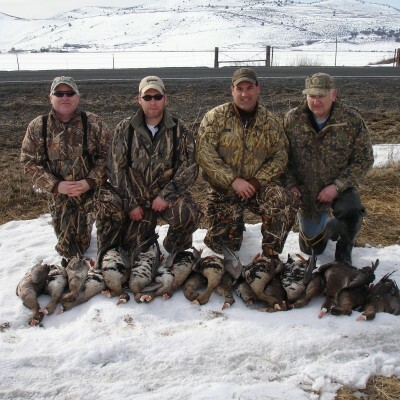 This March 2009 trip to Klamath Falls would find us once again hunting with Darren Roe of Roe Outfitters. 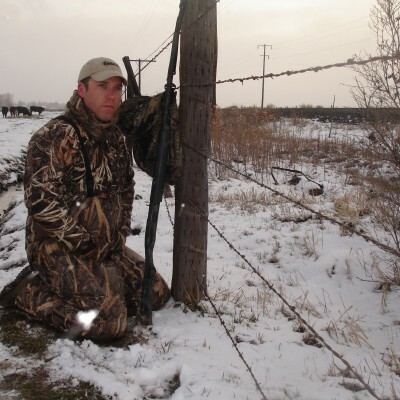 We had hunted both 2007 and 2008 with Darren and had capitalized on the Oregon DFW’s gift of a late season two-bird limit. This year the limits had been modified to match the goals and needs of habitat management. The previous seasons had been exclusive to specklebelly geese. 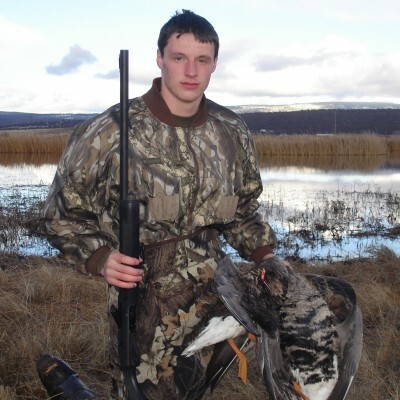 Snow geese had now been added to the menu. We would be allowed no more than one speck, but could fill the remaining three slots with snows. To my mind, four is almost always better than two! We arrived in K-Falls late Tuesday evening and met up with Scott, Bud, and Michael. Scott and Bud had hunted with us on both previous K-Falls adventures. Michael (Scott’s eldest boy) would be experiencing his first speck hunt. A quick phone call from Darren alerted us to the 4AM meeting time and the subsequent 3AM wake-up. We readied our gear, told a few war stories, consumed a couple of adult beverages, and hit the rack. The next morning greeted us with fresh snow and sub-thirty degree temperatures. We met Darren at his shop and, after exchanging the pleasantries requisite to having not seen each other for about a year, headed out to our hunt site. We arrived at a private field and immediately began unloading Darren’s cargo trailer of the blinds and decoys found therein. Bordered by a large, shallow pond, the field looked familiar to both Scott and I. We would later find out the pond had been the location of our last hunt with Darren, one which would end in four-man, two-day limits. Hopefully we could carry over the location’s luck for one more hunt. I should mention Darren was not the only long-lost hunting buddy with whom we’d renewed contact that morning. 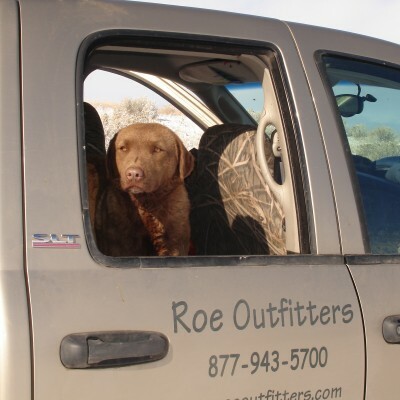 Along for the ride was Georgie, Darren’s Chesapeake Bay Retriever, who is likely the only life form I know who hunts harder than Darren! She’s a real sweetheart and a credit to her breed. 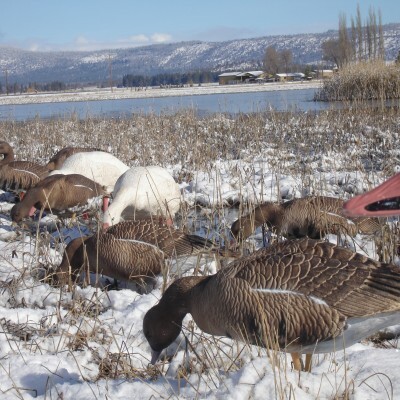 After setting up a combination of Dave Smith Decoys-brand specks, snow rags, and full body snows and honkers, we settled in to the Final Approach blinds and awaited shooting light. It came. . .and the birds did not. Though a few smallish flocks of snows passed us by at supplemental-oxygen heights, no birds worked into our spread. At about nine, Darren made the call. Something didn’t feel right about our set-up. The changes in weather had also changed the behavior of the birds. Adaptation would be the word of the day. 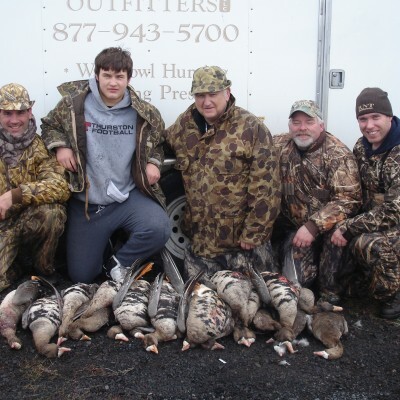 We quickly repacked Darren’s trailer with all of our hunting implements and sped off toward a private marsh in which Darren had faith the birds could be found. We arrived just outside of Dairy, Oregon, and immediately began frantically reassembling our spread. The marsh we would hunt was surrounded by cattle pastures. I could immediately tell the location was much improved. As we set about putting our spread together, groups of nervous specks and raucous honkers sounded their displeasure toward our trespassing. We hurriedly set out our decoys and blinds and settled in to try to salvage the remaining hours of the first day’s hunt. After an eternity of waiting (more likely a half-hour), we began seeing groups of specks slowly work into the area. With Darren on the call and DSD decoys on the ground, I remember thinking about a line from a forgotten movie (or book): Abandon hope all ye who enter here! A pair of specks worked down into range and were met with a volley of fire from Michael, Dad, and Scott. Apparently our shooting had improved, as both birds remained after the smoke had cleared. This was, however, to be our only shooting opportunity of the day. Though we were discouraged by the lack of expected bird activity, the end of the first day met us with a “First”. With frozen fingers and toes, we called the hunt and loaded up the trailer. Bud and Michael would have to return home that evening. Scott, Dad, and I would remain to see if Day #2 would bring us the shooting with which we were more familiar. We returned to the same marsh the next morning and while the location was the same, the tactics would deviate from the previous day’s methods. We set out the DSD’s and socks along the outer shore of the marsh and then waded out to the nearby islands. Sitting in lawn chairs in the tall reeds, Darren hypothesized the location would enable us to catch the birds as they circled into the spread. Given the luck we’d had with Darren on previous occasions, I didn’t question (nor did I doubt) his plan. The day’s first rays of sunlight found us hunkered down and ready for action. As the morning passed, we were blessed with modest numbers of specks, who worked into our decoys in pairs. It didn’t take too long before our four-man limit was reached. During our time in the blind, we noticed the snow geese were not going to cooperate with our plans for four-man limits. Lacking in numbers, what few birds were in the area were simply not interested in our location, decoy spread, or any of the myriad of little mitigating factors which cause geese to decide where to go. At about 1PM, we decided to call it a day at our location. Darren suggested he might have an option for a quick afternoon hunt. After settling on a time, Dad, Scott, and I headed off to check out of our motel room and get a bite to eat. 3PM found us back at Darren’s shop. As we stood in the parking lot, we began to notice the skies filling with flocks of snows. 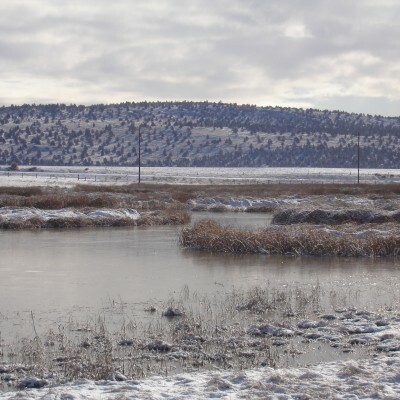 Darren’s shop is a short distance away from the Klamath Refuge and, given the numbers of birds working into the area, it appeared a migration was unfolding right in front of our eyes. We quickly donned our boots and bibs (a welcome respite from waders) and hustled across the street to a private field which Darren had permission to hunt. Hunkering down behind fence posts, we tried to pass shoot the feathered hoards as they circled in and out of the refuge lane. Darren managed to scrape a snow out of the sky at nose-bleed altitude. Scott knocked one down as well, though it managed to sail clear across the county before finally succumbing to a payload of Black Cloud. But as the day came to a dark and snowy end, I came to remember and accept one of hunting’s most sobering altruisms: You won’t always limit. Did that detract from my two-day Klamath adventure? Did it minimize eating great pizza, killing a pitcher of good hef, laughing all the way to and from the hunt sites, harassing my Dad for driving like Mario Andretti across the iced-over Klamath highways, or once again being a part of Magnificent Creation? 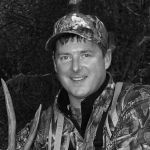 Matt Thomsen routinely spends over seventy days afield each year during Oregon's hunting seasons. 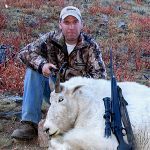 In addition to chasing bear, deer, elk, coyote, waterfowl, upland game, and the occasional sage rat or two, Matt was fortunate enough to draw one of seven annual tags and harvest a Rocky Mountain goat in Oregon in 2008. Quite your whinning. We were only sideways once while passing the tanker. Well three times if you count all the fishtailing we did. Won’t ever forget the hunt though.